What surrounds you is just as important as what’s inside you. For far too long, mental health care has been delivered in dingy office buildings, with dated waiting rooms, and a clear separation between you and the professional you’re seeing. It’s time for a drastic change in the way people receive care. The reSTART experience starts with a warm, bright, and inviting space where you’re part of our community. Meet others seeking sustainable screen use. It’s not easy to be progressive. In fact, it’s quite difficult. Likewise, changing your pattern of use is challenging and requires strength to go up against the status quo. But you don’t have to do it alone. Music has a way of touching the soul, and expressing the messages we feel deeply. Given voice, thoughts, like music changes our perspective. And ultimately our lives. Humans are meaning making people. We seek to matter and we’d like to be heard. Therapy, coaching and counseling provides the needed guidance to pursue your purpose. Find a sense of balance. With digital distractions on the rise, the need for a life in balance is more important than ever before. At reSTART, we work together to foster greater opportunities by examining all the factors leading to excessive or problematic use. 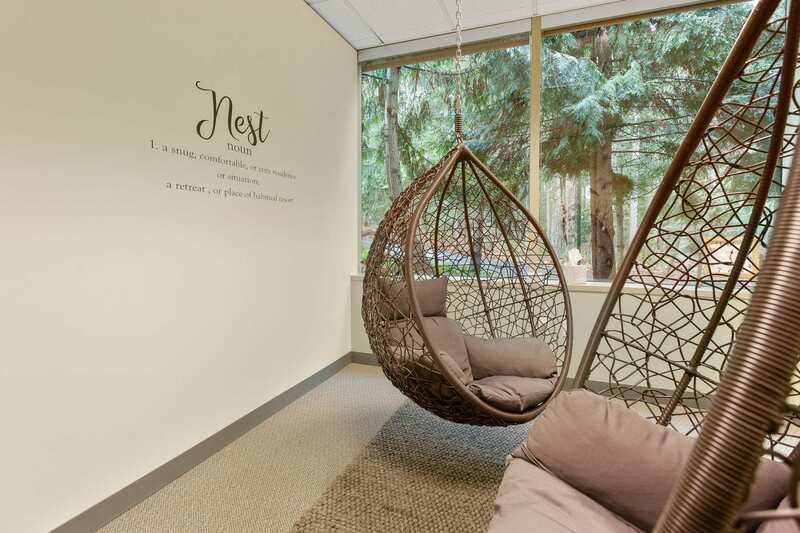 Step inside our Bellevue campus and you’ll see why reSTART was nominated as one of the world’s 50 most innovative companies in 2017. Simply put, we’re just different. At reSTART, we put you in charge of your own mental health. Our entire center is designed to inspire health and healing. When you visit your therapist, YOU choose which room you’d like to meet in, not the other way around. While the providers you meet with are clinically skilled and specialized, we fundamentally believe you possess what it takes to live the life you desire. Our primary role is to accompany you in your quest for a healthier, happier life. Connect with people who care. What mental health conditions do you treat? In addition to our residential care, reSTART offers counseling services for people with behavioral addictions and co-occurring conditions. Our licensed mental health counselors specialize in supporting people who may be struggling with problematic digital media use, video game addiction, social media overuse, gambling, compulsive shopping and Internet addiction. Yes, we offer integrative psychiatric medical care under the direction of Dr. Samantha Desmond. reSTART does not accept insurance for outpatient services. Some patients have had success in submitting our invoice for out-of-network reimbursement. We are located in Bellevue, Washington just two blocks south of the Microsoft campus. While we only provide face-to-face counseling and psychiatric sessions in Bellevue, we do provide life-coaching nationwide.